Fernando Carpaneda has come a long way, both literally and metaphorically, in a career that has spanned over 35-years. Through his award-winning sculptures and provoking paintings Carpaneda demonstrates his ability to capture the underground in a way that is honest without being crude, candid without being invasive, and visually compelling enough to light up Times Square. We pry into the mind of an artist that puts himself completely-think DNA-into each piece and has no problem finding models on Craiglist. Fearless and talented Carpaneda tells all. Knowing that sculpture is your main form of artistic expression what would you say sets it apart from painting and stencils? I try to interrupt the social reality that surrounds me, shifting certain notions of right or wrong in my work. I love paintings, but I think with sculpting the human and new forms I can explore new possibilities. I worked 15 years with assemblages [a work of art made by grouping found or unrelated objects] before starting to sculpt. What fascinates you about the punk and underground scene? Was there a specific moment in your life where you found yourself identifying with this scene? When I was a child in the late 70s, I was watching television and my mother changed the channel to watch the evening news. That was when it appeared, a reporter talking about punks in London and showing images of people with mohawks and piercings. Never seeing anyone like them before I felt a shock through my body, I felt attracted to them. That was the day I discovered that the world had a door, and I wanted to go through it, I wanted to be a punk. From that day forward, my life changed and consequently influenced my art and my way of seeing the world. When I became a teenager in the early 80s I got involved with the punk movement in my city Brasilia, Brazil. I began to make paintings and sculptures depicting my friends, ex-lovers, and punks. Then around 1995, I contacted the CBGB’s art gallery and began to exhibit my works in New York. For me, the punk movement will never die. When people became more informed about what was happening around the world…outside of big media, punk was reborn and became a powerful political movement. Punk today is not about colorful hair or mohawks, and has nothing to do with New York Fashion Week; Real Punks are on the streets fighting for social issues, helping people, and fighting against the government all over the world. I read that when you create human form sculptures you collect and incorporate something from the actual person (condoms, hair, etc.). What inspired this and is it something you do with all sculptures? Yes. I always used personal objects from the people I pictured. Like when Joey Ramone died I was presenting in the CB’s Gallery – CBGB’s and collected some of the objects his fans left on the sidewalk in front of the club, like a kind of altar or mausoleum. I used these objects as a base for his sculptures and gave then to Arturo Vega. I think it is important to use objects that made part of the figured person’s reality. I’ve always used my hair and the hair of some of my models in the sculptures too. Each of my sculptures tells my story through the DNA of my hair and the history of my models. Who would you say has influenced you artistically? On that same note who are some of your favorite musicians? John John Jesse and Tom of Finland are my biggest artistic influences. Musicians are: Sioux and The Banshees, The Ramones, The Casualties, Anti-Flag, Bauhaus, Boy George, Toilet Boys, Avoiders, The Sisters of Mercy, and Nausea. Why create a magazine? How has Carpazine evolved since the first issue? I decided to create “Carpazine” to help promote new artists. Many artists asked me for help and support so, I thought that creating a magazine would be a way to help several artists publicize their work and get their names out there. Since the first issue, the magazine has gained a lot of support from artists from all over the world. What have been some highlights of your art career thus far? In the last 35 years of my career I have had several exhibitions and works which I consider significant. One of those works was the illustrations I made for the book “The Best of Punk Globe Magazine“. The book brings together exclusive interviews with Debbie Harry (Blondie), Jamie Oliver (UK SUBS), Sid Vicious, Earl Slick, John Lydon, The Adicts, Glen Matlock, Joe Dallesandro, Andy Warhol, and Pauley Perrete. Punk Globe Was created in August of 1977 by Ginger Coyote, and continues active until today. I was also a part of two art exhibitions at CBGB that I consider historical: “The Bowery Electric Festival” in 2002 and “Back to the Bowery” in 2005. “The Bowery Electric Festival” was curated by Arturo Vega [the artist who created the famous Ramones logo] and had the participation of The Ramones founding member Dee Dee Ramone. whose paintings were showcased. 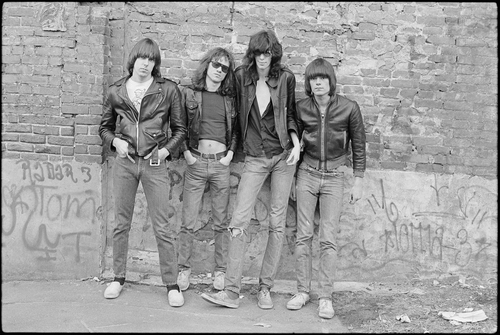 “Back to the Bowery” brought together various artists that included: former archivist of the Warhol Factory Billy Name , British rock photographer Mick Rock, and photographer Roberta Bayley, who took one of the world’s most iconic photos of the Ramones. Another epic highlight was when my paintings were projected on gigantic LED screens in Times Square back in 2012 during the opening of the exhibition “Art Takes Time Square”. The scale of the exhibition was extraordinary and seen by more than half a million people. Do you have any exciting shows or exhibitions you would want to let our readers know about? I will be showing my works in Brazil at ARTEXXX Gallery in December 2017 and at MF Gallery in Brooklyn, NY in 2018. UPDATE: Fernando Carpaneda’s acrylic painting Ken will be exhibited at “A Quotidian Life: Finding Beauty in the Ordinary” in Dix Hills, NY.